At Hospice of the Red River Valley, we’re fortunate to have many dedicated volunteers. We celebrate their contributions to the organization and the ways they enrich our patients’ lives. Click here to find more information about our volunteer program and learn how to apply. 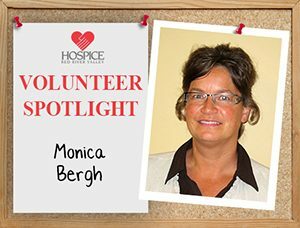 Why do you choose to volunteer with Hospice of the Red River Valley? I was encouraged to volunteer by a hospice nurse. My father and mother-in-law were both served by hospices. I find volunteering very rewarding. I’ve met so many families, and I feel honored to be a part of this wonderful and caring team!